Wow! My abs are SORE after this one! I want to show you guys how I’m doing my hanging leg raises these days as I’m getting great results with them. Hang from a chin-up bar with either a wide or medium grip (medium grip is more comfortable for me). In fact, perform the whole movement quite deliberately and under control. If you go too fast, your body will start to swing and ruin the whole movement. There is no break between the sets, think of it as 1 set. Simply go to positive failure, then set the weight down (at 27 second-mark in the video) and keep going and knock out as many extra reps as you can. 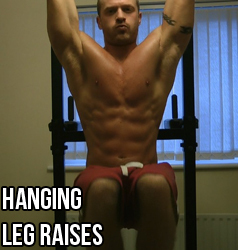 In THT training, you want a weight that allows you to get anywhere between 8 and 15 reps per set for hanging leg raises. That’s weighted reps. Don’t include the unweighted drop-set reps in that. So to clarify: select a weight that forces positive muscular failure anywhere between 8 and 15 reps, then hammer out as many unweighted reps as you can afterwards (there’s no need to count the unweighted reps). I’m absolutely loving these right now. NOTE: Some people prefer to use ab straps here to hang from. If you want to, that’s perfectly fine. Add this drop set method into your next ab day and remember – no rest in between. Would you super set each set with a 2 minute gap between? Also, the height of the chin up bar at my gym means that the dumbbell rests on the floor after full extension, is this ok? hey mark! so lets say i just finished my cut doing tspa for 6 weeks or so, what do you suggest i do to transition to bulking with the MANS diet, in order to gain back little or no fat when i begin bulking again? THANKS MARK YOURE THE BEST! @Matt. If it’s just 3 sets total, then yes go ahead and drop-set all 3. Hi…I doing exercise of bycep…but there is effect on bicep…it means that there is no cutting in bicep…could u suggest…how to get cutting? I do 3 sets of Weighted decline sit-ups – 3 sets of reverse weighted crunches and then 3 sets of hanging leg raises. Would it still be ok to super set the raises, or just on the last set? @Manoj. I don’t really understand your question. The best bicep exercises are contained in my THT program, download it free. @Matt. These are supersets. I use the term superset when talking about working to DIFFERENT body parts back to back (a strategy I’m not a fan of). So do the drop sets on your last 3 sets only. i and other vegetarians like me need your help mark to follow your tspa diet. we get the principles,but couldnt find suitable foods that could fit the list.if you could,please give us a sample diet.it will help me and people like me who wants to follow your program.